I find myself conflicted every time I’m presented with the opportunity to interact with marine mammals. The rational part of my brain says I should respect these intelligent creatures and keep my distance, but another part of me wants to seize any opportunity to forge a connection with them. During my final graduate course at Duke, we traveled to Hawaii where we encountered the management issues that pertain to human interactions with spinner dolphins (Stenella longirostris longirostris). Spinner dolphins are a smaller dolphin species that are known for their acrobatic displays above water. They also exhibit distinctive foraging behavior. At night, they swim offshore and forage in groups. After feeding, during the day, they rest and recover in calm bays. These bays are also popular with tourists in Hawaii. The increase in interactions between tourists and spinner dolphins has scientists concerned for the well-being of this dolphin species. 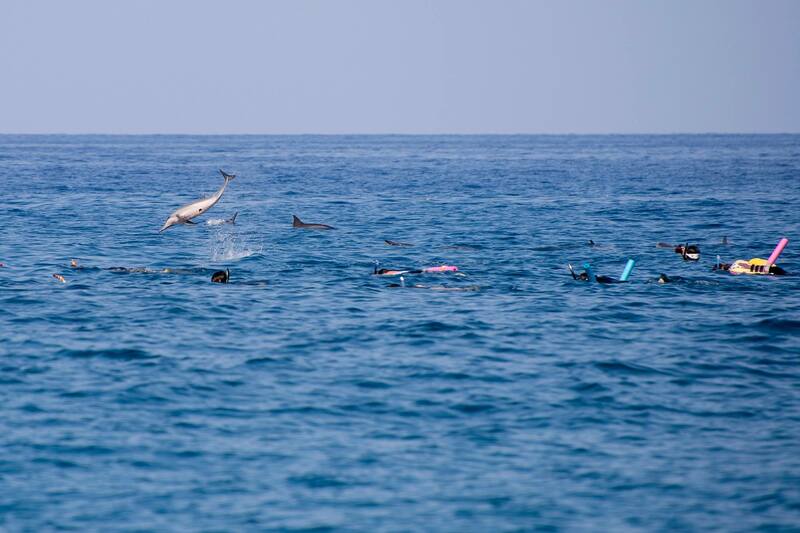 Our class chartered a boat along the Kona Coast of Hawaii’s Big Island to witness these interactions. As our boat approached a bay known to be popular among spinner dolphins, I counted six boats. Upon arriving, we saw 30-40 people in the water with approximately 20 dolphins. The boat’s captain was surprised when he heard that we didn’t want to get in the water, and said, “So, you don’t want to have any fun?” Dolphins are charismatic, and watching them spin in the air and swim around our boat I found myself wondering, “Would 12 more people in the water really bother them?” It’s hard to not want to be near them, but we resisted. It was apparent that our tour operators also find themselves conflicted. They realize that human pressure has increased. Yet, they insist that they can tell when the dolphins are “done interacting” and move on when they see those behavioral cues. Later that week, our class visited Honaunau. This popular beach is frequented by snorkelers and dolphins. Before unpacking our snorkel gear, we spotted the dolphins from shore. Surrounding them were about 20 swimmers, and we heard them splashing and yelling as they chased the dolphins. A week earlier, we met with NOAA employees in Honolulu. They are drafting a rule to manage the spinner dolphin interactions. Currently, they are proposing that people maintain a 50-yard distance from spinner dolphins. After witnessing the boats and swimmers, this rule seems like it would be very hard to enforce. Area closures have also been proposed. This method would be easier to manage and would allow the dolphins the solitary time for resting. The crew from our boat also supported the area closures over the 50-yard rule.